n 1913, Wright Co. chief engineer, Grover Loening, designed this seaplane under the supervision of Orville. The Model G had a 38-foot span; 430 sq-foot area; 6-foot chord; 5-foot separation; 28 feet length; and weighed 1,200-1,300 pounds. With its 18-foot boat-like hull, it was the first product of the Wright Company to have an enclosed cockpit. Early versions of the twin-propeller pusher had the motor in the rear and the pilot sat in front of it. Later the engine was moved in front of the pilot, who sat behind it and beneath the wings. Powered by the 6-60 motor, the aircraft flew up to 60 mph. Loening introduced several "non-Wright" features on later versions of this aircraft, such as dihedral wings, a non-flexing two-piece elevator mounted on top of the rudder, and an optional wheel to control the pitch and roll. McFarland, Marvin W. (ed) The papers of Wilbur and Orville Wright. McGraw-Hill Book Co., New York, 1953, p 1183. Pictured in plate 218. 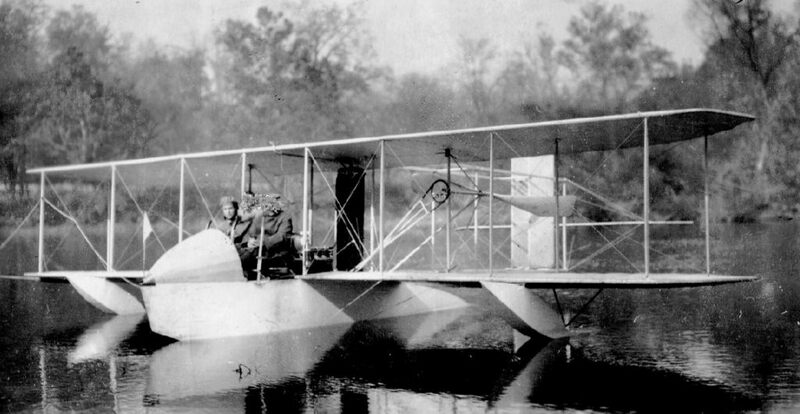 Loening, Grover C., "The New Wright Aeroboat Type "G"." Aeronautics, Vol 14, No 6, Jun 15, 1914, pp 170-171.